Are you tired of costly exterminators and non-effective pest repellent that do not work? With Ultrasonic Pest Repellent from VEPOWER, your problems will be solved. It's normal that the mouse and vermin will increase at the beginning of the using days because they are getting away from the living place after the attack of the ultrasonic. Usually, it could take 3~4 weeks to notice results. 1. Keep distance from carpet, curtain and any sound absorption material that may reduce the effect. 2.The number of rodents and insects may increase in the first few days. And the pest repellent will drive them away completely for good about four weeks later. 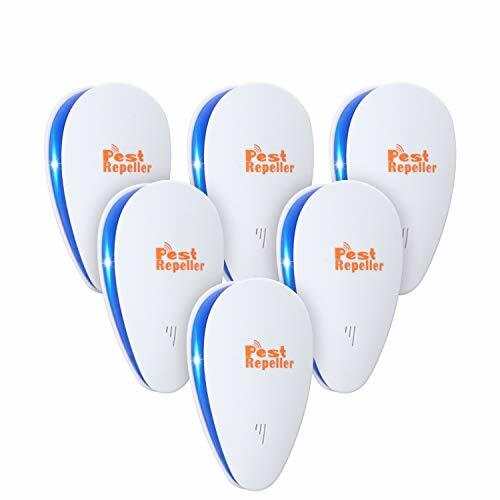 ✦UPGRADED CHIPS TECHNOLOGY✦: Which is much better than normal ultrasonic pest repeller. The pest control ultrasonic repeller uses newest ultrasonic and electromagnetic waves to drive away mice, rats, spiders, ants, bugs, cockroaches, mosquitoes, fruit flies, flea, crickets, gnats, insects and rodents. ✦MORE SAFE FOR CHILD AND PETS✦: Throw away the harmful poisons, dangerous chemicals, and traps typically used in households and by insect control technicians. Our mice repellent is 100% safe and effective. Ultrasonic sound is inaudible to humans and household pets; Environmental friendly alternative to harmful and dangerous chemicals, poisons and traps, no bad smell. ✦Wide Effective Coverage✦: The Insect & Rodent Repellent is effective in an indoor area up to 1600 sq. ft. It's widely used in homes, warehouses, offices, gardens, hotels, etc. We recommend you to install one for each room because the ultrasound cannot penetrate walls and solid objects. But for areas with serious pests, we suggest install 2 or more devices for other room. They aren't effective for other rooms if you install device at one room. ✦Easy To Use✦: Just plug the pest control repellent into the socket. Please make sure to install it vertically 7-31 in away from the floor. And make sure there are no barriers like curtains or cabinets covering in front of the repellent. Most customers can see the results within 2-3 weeks! Then we can say goodbye to pest and mice! ✦LIFETIME GUARANTEE ASSURANCE✦: Our ultrasonic spider repellent is backed by our Lifetime guarantee because we want to help you get rid of those pests and we offer a money back guarantee if you don't see results within 4weeks. Typical results can take 3-4 weeks depending on the amount of infestation. If you have any questions about this product by VEPOWER, contact us by completing and submitting the form below. If you are looking for a specif part number, please include it with your message.